While Seattle’s experience with snow and ice is very limited in comparison to many other U.S. cities, one can easily find themselves in the thick of it within an hour’s flight time. 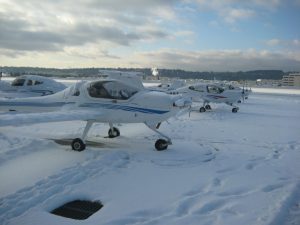 For instance, you can depart Boeing Field on a 45 degree January day in the sun and find yourself in Yakima in the same sun, but with temps in the 20s and two inches of snow and ice. Winter’s grip used to maintain its hold for several months where I first learned and trained others to fly. There, the procedures and thought processes were fresh in mind and all too commonplace. In Seattle it’s a different story. Here are a few things to keep in mind when dealing with cold temperatures, snow, or worse, ice with regards to airport surface operations. Runways – It may have quit snowing last night, but what are the field condition (FICON) reports for runway conditions and braking action? Many airports have several runways, but may only plow and maintain one of them due to limited staff and equipment. Some may not file a NOTAM at all. Don’t assume a lack of reports means everything is ok. I once was landing at an uncontrolled airport and asked by the approach controller to provide a braking action report. I happily obliged not realizing I was the first plane to arrive that day. Never again. The runway was clear of snow, but a layer of black ice had formed that didn’t register beneath the overcast skies. I touched down and felt myself start to slide and weathervane into the crosswind. I promptly executed a go-around, reported back braking action nil, and was picking pieces of seat cushion out of my pants when I returned. Taxiways & Aprons – How are the taxiway and apron conditions? I’ve seen a runway cleared of snow and as dry as Knox County, Kentucky, only to find myself plowing through two inches of crunchy snow on the taxiway and aprons. If your plane has wheel pants you can forget even getting through! Knowing this information beforehand may preclude you from even taking off in the first place. Hangar Space – This can come at a cost, but it may be cheaper than a hotel. If you’re thinking you’ll need a hangar, you can bet ten other pilots are thinking the same thing. Call ahead, get a quote, and see if you can guarantee a spot. Escaping contamination as well as avoiding a cold-soaked aircraft can make all the difference in getting out on time. Engine Start & Run-up – When getting ready for engine start in colder temperatures, keep in mind that the battery will not be at it’s best. Restrain from dilly dallying and ensure everything is in place before turning on the battery master for engine start. Second, be gentle on your engine. Let the oil temperature rise before doing a run-up. Don’t take off unless your oil temperatures are at least above 100°F, or in the green arc. If the run-up area is contaminated with snow and ice, you’ll need to be cautious. One can easily miss that they are creeping across the slick apron while their eyes are inside on the gauges. Also keep in mind where your tail is pointed so you don’t blow snow and ice into another plane. Coffee and Cockpits – If you introduce moisture into a cold cockpit, you’re going to have a hard time seeing outside. Most GA aircraft won’t produce warm defrost heat until…oh, probably climb out. A steamy cup of coffee will fog up your windows before you’ve even turned on the avionics. Funny enough, I watched a student who somehow managed to stuff the entire bag of Big League Chew chewing gum into his mouth only to find his side of the cockpit fogged up. Yes, his moisture laden, grape flavored breath was clinging to the windows and, yes, I could hear every salivating chomp through my headset. If you do fog up inside, please take the time to fully clear the windshield with a clean cloth. I cringe when I see a pilot taxiing past while peering through an eight inch circle they rubbed off the windshield.